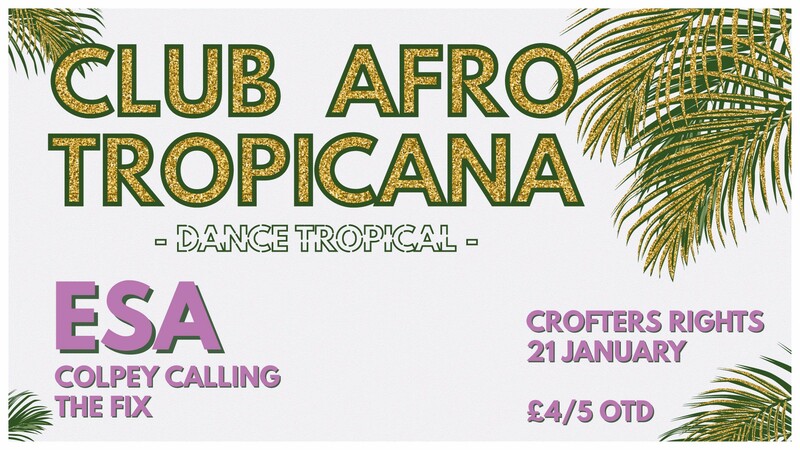 Here at The Fix HQ we’re gearing up for the very first edition of Club Afro Tropicana, a night curated especially to fill your winter with glittering palm trees and sun-kissed rhythms. Basically, everyone hates January, so we’re skipping the whole darkness and rain business and instead taking you on a journey through shimmering summery paradise. We’re incredibly excited to be bringing South Africa’s Esa to town for this foray into solar-powered Latin funk, disco, afrobeat, house and techno, ably back by our very own resident DJ Colpey Calling. Esa is a Boss. From his role as part of Ata Kak’s live band to his collaborations with Auntie Flo, Esa has tailored a sound that fuses modern electronics with worldwide sounds. His DJ sets showcase genres from across the continents of Africa and South America while not losing sight of the dance floor as he delves into electronic sounds by the way of acid house and techno. We caught him a few times in the last year, and he is an amazing selector, so let him guide you through tropical and sun-soaked beaches as he soundtracks this tropical celebration. Colpey Calling has just spent a few months in East Africa and will be bringing a bag packed with Rhumba and Benga gems. He has a collection that stretches from jazz to post punk and everything in between- expect a diverse selection without diverting too far from the tropical theme.